There are multiple places in Brokersumo you can deduct and add fees. You can add them on the commission plan, in the agents profile or on the commission disbursement. 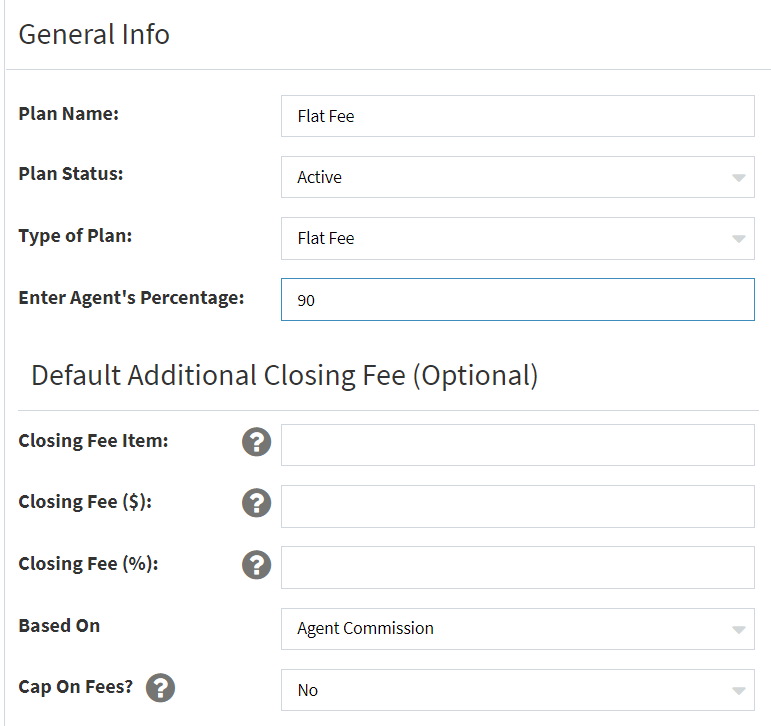 Additional closing fees- These are fees that will be taken off the agents commission after the split and will be credited back to the brokerage. For example a transaction fee. You can use a percentage or a flat fee dollar amount. The fees will be deducted off each transaction, that every agent that is assigned to the specific commission plan, on the commission disbursement. Pre-commission credit/debits- These are fees that are credited or debited to the brokerage gross commission that are taken off the top, or before the agents split is determined. For example a franchise fee. You can use a percentage or a dollar amount for these items. If you use a percentage you can choose to have it come off the brokerage gross commission, agent commission, sales price or agent commission after closing fees have been taken off. If you use a credit you can credit (pay funds) to a vendor- or an outside 3rd party. Or you can have it credit towards another agent in the company by choosing agent and choosing agents name. 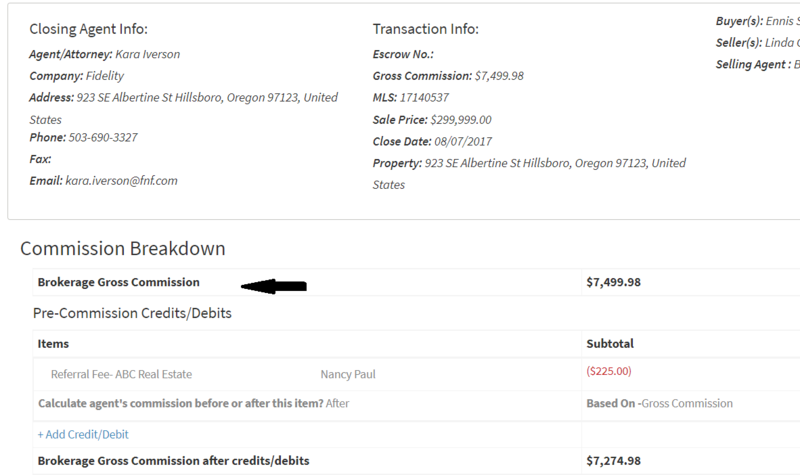 If you choose a debit (collect funds)- after you put in the percentage or dollar amount you need to choose before or after- Calculate agent's commission before or after this item? Before- the agents split will be determined before this item is credited or debited. After- the agents split will be determined after this item is credited or debited. Include this credit/debit in the Total Due to Brokerage? This is for display purposes on the disbursement, it will include this fee in the Total Due to Brokerage line item in the Final Commission Breakdown section of the commission disbursement. If you are collecting the fee at closing and will pay it our yourself to the vendor, then you would select Yes for this. If the fee is being paid at closing by the title company or attorney as part of the closing funds, you'd select No. Fees you would add to the agents profile are fees that are associated with the specific agent on every deal, for example E&O Insurance. You would enter the additional closing fees and pre-commission credit/debits the same as the above- they are just specific to the agent. Post Commission Credit Debits- These are debits/credits to an agents commission after the commission split. These fees come directly out of the agent's commission. You would add these fees in the disbursement in for transaction specific fees such as a referral fee or paying closing costs to a client. 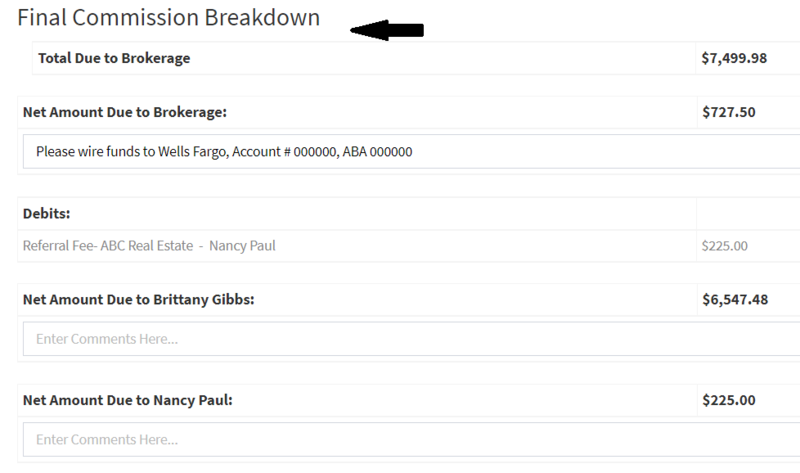 The Commission Breakdown- is the brokerage commission breakdown that includes any commission adjustments being made. The Listing/Selling Agent Commission- is the agent(s) commission breakdown that includes any commission adjustments being made. The Final Commission Breakdown- is the final commissions due to all parties on the transaction after all adjustments are made. These are fees that are credited or debited to the brokerage gross commission that are taken off the top, or before the agents split is determined. For example, a referral fee to an outside brokerage. You can use a percentage or a dollar amount for these items. If you use a percentage you can choose to have it come off the brokerage gross commission, agent commission, sales price or agent commission after closing fees have been taken off.